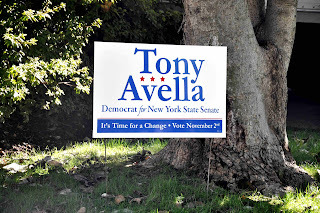 In an extraordinary bout of good sense, the United Federation of Teachers has decided to endorse Tony Avella for NY Senate. It's extraordinary because Avella is a pro-teacher candidate who may actually speak for us at a time when many pols are in the bag for educational "reforms" that not only fail to benefit schoolchildren, but also bludgeon unionized teachers simply because they're unionized. This is important because we will need friends in Albany, and it's quite clear neither Paladino nor Cuomo intends to be one. So there's Silver, but he will need a little help in the Senate, and we will need a few honest pols to help balance the ones DFER and their hedge fund buddies have managed to buy off. Padavan won by 500 votes last time, and I'm hopeful the UFT will be able to turn that around and accomplish something worthwhile. This is precisely what the UFT should've done with Bloomberg last year. We can't fix that, but we can help get at least one reasonable, decent person in Albany. I'll be volunteering for phone banks at Queens UFT, and if you're in the area, I hope you'll do the same. Maybe if we win this one we can convince the UFT to make a habit of actively supporting pro-teacher candidates.